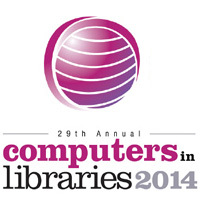 Save the Date for Computers in Libraries 2014, April 7-9, Washington Hilton, Washington, DC, the most comprehensive North American conference and exhibition on all aspects of library and information delivery technology. 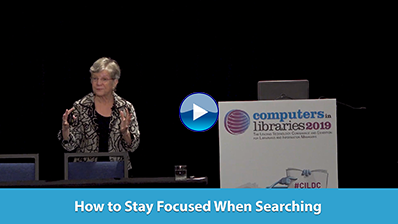 While the tools and technology available to libraries and information services have changed over the years, the excellent quality and range of both topics and speakers at Computers in Libraries 2014 remain the same. To receive conference updates or for more information, click here. Last month, the ebook subscription service Scribd and Smashwords, "the world's largest distributor of independent ebooks," announced a two-part collaboration they hope will consolidate their position in the emerging independent ebook publishing/distribution marketplace. Elsevier launched a new generation of its SciVal research solution featuring enhanced analytics and a new tool for helping research institutions support their evidence-based decision making. Elsevier integrated the analytical capabilities of SciVal Spotlight, a research performance assessment and strategy execution tool, and the SciVal Strata benchmarking tool with the new SciVal, making its service more comprehensive and intuitive. The U.S. Government Printing Office (GPO) released its Strategic Plan for fiscal years 2014-2018. It discusses the organization's intended evolution from print-centric to content-centric. A key goal of the plan is the addition of official, digital, secure publishing services for Congress, federal agencies, and the public. Yahoo rolled out Yahoo Tech, a portal composed of technology news, reviews, and best practices represented by photos and GIF (graphics interchange format) images. It is designed to accommodate smartphone and tablet users with stories that expand in the current window and collapse when a reader is finished. The Online Information conference, hosted by Incisive Media, announced on its website that the conference has closed. Previous Online Information conferences addressed topics such as social media, Big Data, mobile devices, ebooks, and open access. As the BYOD (bring your own device) trend grows in popularity, companies need to be more vigilant about protecting sensitive information. Since mobile devices don't always have the same security protection as corporate-owned desktop computers, the use of personal smartphones, laptops, and tablets expose businesses to security risks if the proper safeguards aren't taken.